Last year I changed the way I watered my greens. Instead of watering them last thing each night, I watered them first. The theory was that it would give the stressed out grass water sooner and allow the plant to recover all night long. Although I have no way of proving if this theory was what actually happened, I had the easiest year ever keeping my greens healthy and well watered despite the record drought we experienced. I also did not require any pesticide applications other than phosphite during the periods I required irrigation to keep the grass green proving to me that the period of leaf wetness overnight has little impact on the diseases I face in my climate. 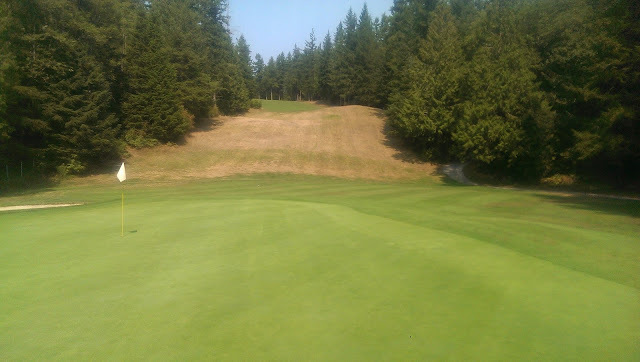 Slight moisture stress on the aprons means it's time to start hand watering for the season. Last year I also decided to use cheap wetting agents (Dispatch) on my greens that are designed for fairways. Again, I had the easiest summer ever keeping the grass green. Either these cheaper products are better than we think or maybe they simply aren't needed anymore. This observation has me thinking, do we really need wetting agents on greens anymore? You are probably thinking, YES, of course we do! There is no question that wetting agents work, we have all seen the studies that show plots where wetting agents have been applied vs plots where they have not been applied. The differences are shocking. Back when I first started in the industry in 2001 we didn't use wetting agents on our greens. We would have to spend a ton of time with hoses hand watering. We would wait until we saw stressed out grass and would apply water to the brown spots. Along came wetting agents and all of a sudden we had a lot less LDS areas on our greens. Wetting agents were a game changer back in the early 2000's for our course. The thing about these studies is that they aren't real life. They aren't rolling, spiking, hand watering or doing anything else. They simply are one step better than doing absolutely nothing. Yeah, so what has changed? Why the hell would you decide to not use wetting agents on greens? Soil moisture meters for one. Just like wetting agents were a game changer back then, soil moisture meters were an even bigger game changer. All of a sudden we could manage our soil moisture levels with precision. We didn't have to guess. We could see moisture issues arise before we could visually see the issues. We could be proactive instead of reactive to moisture stress issues. All of a sudden we need less of a buffer effect that wetting agents provide. Wetting agents to a point allow you to be less precise with irrigation practices. This is why I still plan on using them on tees and fairways. I don't have the time or capability to test soil moisture on tees and fairways and wetting agents allow me to achieve a better level of uniformity on these surfaces that I would not otherwise be able to achieve. But on greens, I test the moisture levels daily in 10-20 spots per green, hand water dry areas, and rarely see turf turn brown unless I intentionally dry things down. 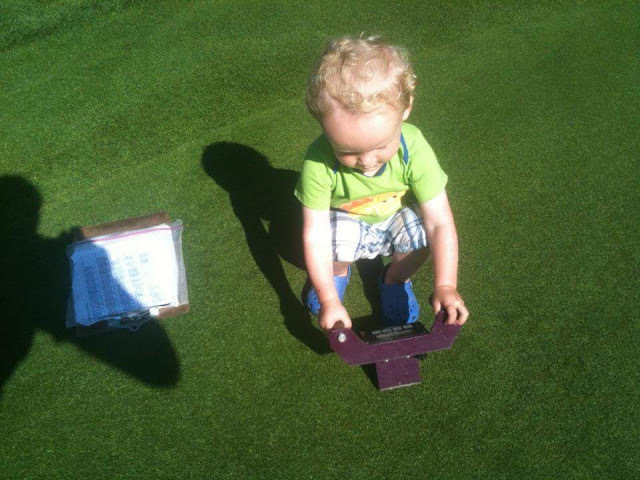 We regularly needle tine our greens. This is a new practice for us in the past 4 or 5 years and it has really made a huge difference. By using non-disruptive aeration practices we are able to increase surface infiltration rates and the amount of air in the soil while also decreasing compaction. 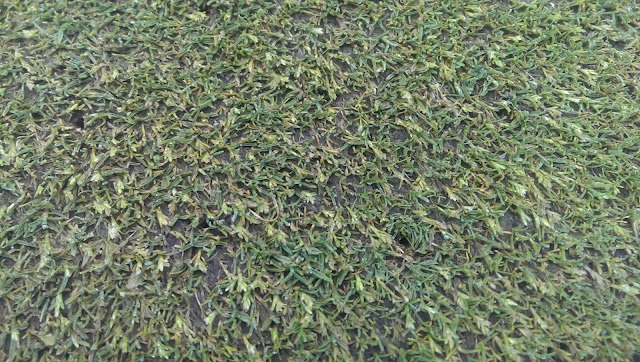 No wetting agent is going to do what needle tine aeration can do for your greens. We roll like crazy. Lightweight rolling has been found to increase the amount of moisture in the soils. We only roll our greens but have noticed that on areas that we roll, we require less water. Chris Tritabaugh shared this pic with me during the Masters tourney. Guess where the roller enters the green in the following pic? 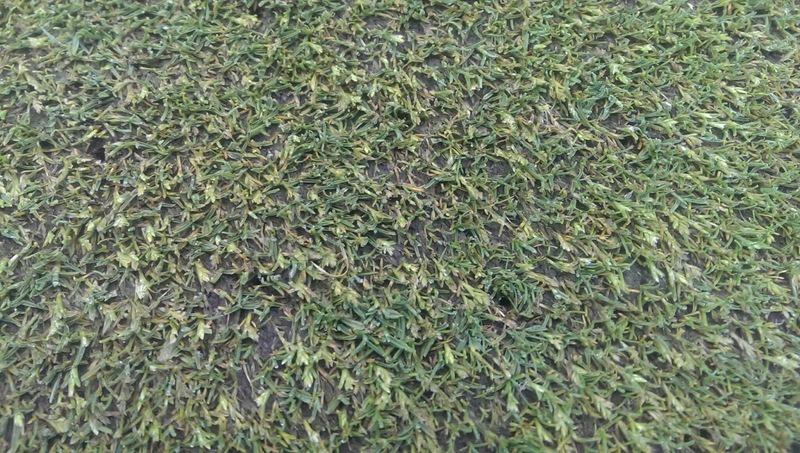 I'm also not worried about disease on tees or fairways to the extent that I am on greens. The only part of the course that we require pesticides are the greens, so moisture management is key in these areas. So you're thinking, why wouldn't you use wetting agents on greens then if you are so worried about soil moisture on them? In my experience wetting agents don't prevent over-watering which is the problem with fungal diseases. I'm a lot less concerned with under-watering on my greens. I often wonder if wetting agents promote over-watering to some extent. On my tees I can apply more water than I would on my greens because I'm not worried about firmness, ball roll, or disease. 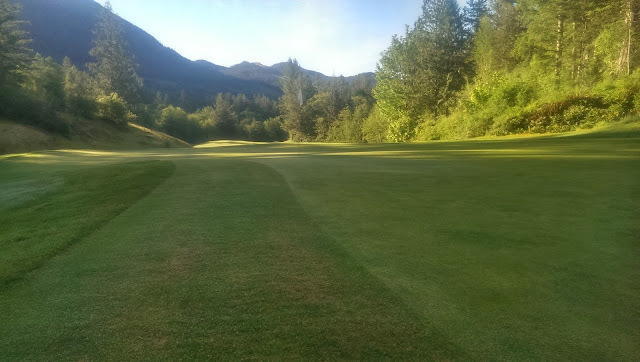 Wetting agents allow me to use less water on my tees than I would use without them, but still more than I would use if I was hand watering, rolling, and needle tine aerating my tees regularly. I also found that with the expensive revolutionary wetting agents (not naming any names ;) ) that it was often too difficult to dry down my greens. They were always wet. This created issues with disease such as cyanobacteria (algae), moss, and brown patch in the summer. Cyanobacteria in 2014. We had none in 2015. I went from spending upwards of $400/acre a month in 2014 to $80/acre in 2015 and in 2016 I hope to spend $0/acre/month on wetting agents for my greens. Either way, I have introduced enough new practices that also improve my water situation that I fell it's time to re-evaluate wetting agents on my greens.